Senior political source on PM's meeting with Russian Foreign Minister, Chief of Staff: We take no position on continuation of Assad regime. 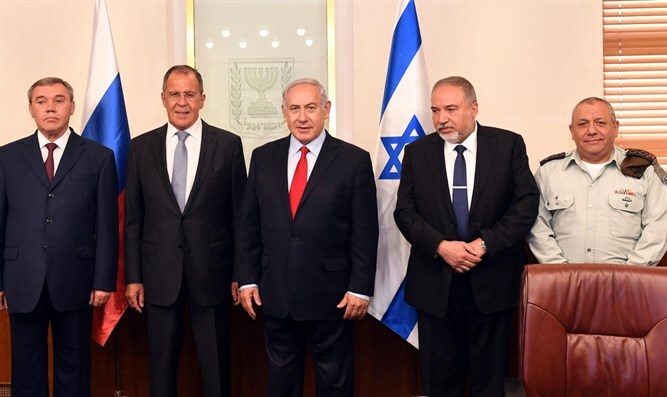 A senior political source participated in the meeting between Prime Minister BInyamin Netanyahu, Russian Foreign Minister Sergey Lavrov, and Russian Chief of Staff Valery Gerasimov, at the Prime Minister's Office in Jerusalem Sunday evening. The meeting lasted more than two hours. "This is an important meeting at a significant time in which we focused on the fine details of the Iranian presence and activity in Syria while presenting intelligence maps and explaining our policy of driving Iran out of Syria," the source said. "It was made clear again that we would not accept Iranian consolidation in Syria, not near the border, and not in the 100-kilometer strip that the Russians are talking about and committing to," the senior official said. "We said that there is long-range weapons placed beyond this area and all these forces have to leave Syria. Russia has considerable capabilities to deal with this, because it is a very significant factor within Syria." He said that Israel had heard the Russian desire to distance the Iranians to a strip 100 kilometers from the border with Israel in the first stage, but made it clear that Israel would find it hard to agree to the plan, and in any case would reserve the right to act to prevent Iran from establishing itself. The source noted that Israel has regular demands regarding the dismantling of the Iranian presence in Syria. "We maintain the full freedom of action of the IDF and we think that Iran's removal from Syria should include the following elements: All long-range weapons are removed out of Syria, the production of precision weapons is stopped, strategic arms defense is removed and the border crossings that allow weapons smuggling on the Syrian border Lebanon and the Iraq-Lebanon border are closed." He noted that "all contact with the Russians is coordinated with the US before and after the fact." According to the source, Israel does not intervene in what is happening inside Syria and therefore the State does not take a position regarding the continuation of the Assad regime. "We never dealt with the question of internal war in Syria, not because we had no opinion about terrible things that took place there, but because we determined that we would not interfere in this system except in humanitarian matters." "We emphasized Assad's responsibility as the host of the Iranians. If he allows them to base themselves militarily against us in order to attack us and in order to destroy us, it is clear that we will do whatever it takes to defend ourselves."